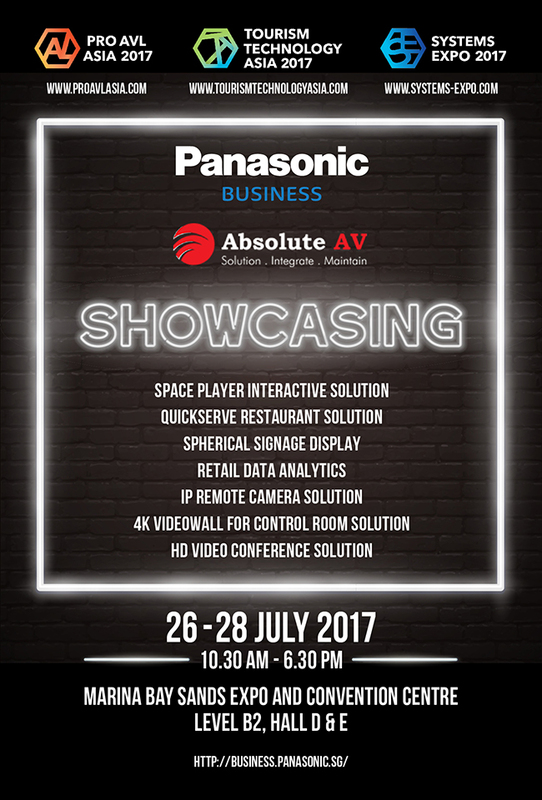 Panasonic System Solutions Asia Pacific, together with our partner, Absolute AV, participate in Tourism Techonology Asia and Pro AVL Asia 2017. Tourism Technology Asia is the Asian Technology Platform for professionals involved in hospitality management, venue management, destination management and meeting planning, while Pro AVL Asia is the Asian event for professional audio, visual, lighting professionals leading the development of entertainment technology around the world. Held over 3 days from 26 to 28 July 2017, Tourism Technology Asia and Pro AVL Asia are held alongside Systems Expo 2017 at Marina Bay Sands Expo and Convention Centre, Singapore.